The Citizenship course covers a number of personal finance lessons. Dealing with debt, saving for retirement, the pros and cons of buying on the Internet and ethical investment are all part of the curriculum. Younger pupils are given basic lessons about bank accounts and mortgages. Older pupils are taught about the possible implications of the financial decisions they make. Even though British teenagers are now richer than ever before studies have shown a distinct lack of knowledge of personal finance. This is why it is so important that we teach our children about personal finance so that they can make informed and sound financial decisions in the future. Teaching your child about money as early as possible is a great way to prepare them for the future. Teach them how to earn, save and spend money responsibly to get them ready for managing their own money.If your child is young you can begin by teaching them how to count coins. Learning how to count, use, and identify coins is an important basic money skill. Once they are comfortable with counting coins and coin denominations you can proceed to working out how to make change with coins. This is one of the more difficult but basic money skills, but knowing how much change they will receive when spending money and purchasing an item or items is very important. Practice with coins and notes. Start with learning to make change for a pound and proceed from there. Take your child grocery shopping with you. Point out the prices and compare the cost of different brands. Encourage them to work out how much ten things will amount to and work out the amount of change would be owed. You can also explain to older children that there are other ways to pay for things without using cash, such as credit and debit cards. Giving pocket money to your child is important for helping them to develop financial skills and learn money responsibility. Your child will have a degree of choice in making decisions about how to spend their money. 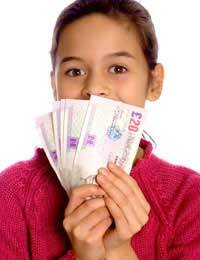 Pocket money is usually allocated relative to a child’s age. It can be increased by a fixed amount on each birthday. No matter how young your child is, it is important that they learn the benefits of saving. Saving can be both rewarding and fun. The best way of teaching your child about saving is to encourage them to start saving. Open a credit union or bank account and get your child to allocate a portion of their pocket money to their savings; or deposit birthday and Christmas present money in their savings account. Let your child see when they earn interest on their bank accounts too. Encourage them to donate some of their savings to a worthy charity and eventually you may even decide to get involved in some fundraising activities. If your teenager has a part time job they will understand what it means to earn a living. This is the time to start discussing taxes, managing current accounts with ATM cards and planning ahead for major expenses. You can even teach your child how to write cheques and do a personal budget. Give your teenager the responsibility of paying for his or her own clothes and expenses. This will help them appreciate how much things cost. Studying personal finance can help a child with their Mathematics and builds confidence in dealing with money and financial situations. As a parent, you can give your child opportunities to learn about money and finance using real life situations, and help them to build sound financial skills that will last them a lifetime.